“Clean energy has gone from being the ‘right thing to do’ in combating climate change, to being the most cost-effective option for many energy-insecure countries,” said Carrie Thompson, deputy director of the U.S. Agency for International Development’s Regional Development Mission for Asia, during a day-long conference on renewable energy at the Wilson Center on October 27 (read part one of our coverage here). “This is as much a bottom-up movement, fueled by open markets and cost-competitiveness…as it is a policy priority for governments around the world,” said Thompson. 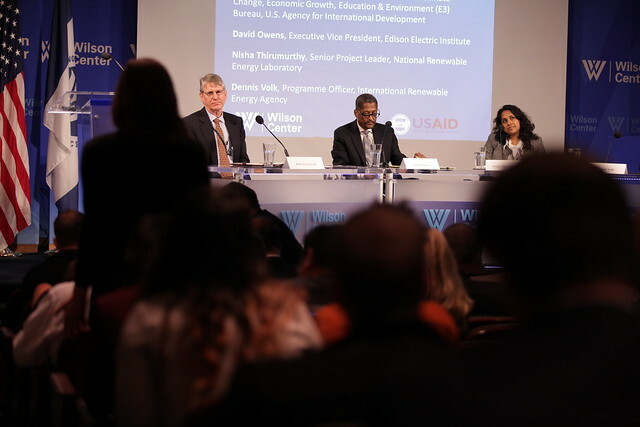 Alex Perera, acting director of the World Resources Institute’s Global Energy Program, cited one company in India that signed a large solar deal for 5.7 rupees per kilowatt-hour rather than pay the grid price of 7 rupees per kWh, and another that opted to produce wind energy at 6 rupees per kWh instead of paying 7 rupees per kWh for natural gas-fired power. Even in Abu Dhabi – capital of the United Arab Emirates, owner of the world’s seventh-largest natural gas reserves – solar prices are now beating natural gas, Perera said. China’s staggering growth and innovation in renewable technologies over the last six years has been a major driver in lowering the price of solar by more than 80 percent, according to Ethan Zindler, head of the Americas for Bloomberg New Energy Finance. Renewables are especially cost-competitive in developing countries where electricity prices are at $.50/kWh or higher (prices in the United States were about $.13/kWh for residential customers in August 2015, and about $.11/kWh overall). “That’s just not that hard for renewable energy to beat,” said Zindler. Global investment in renewables rose from $40 billion in 2004 to a record $320 billion in 2011, adding up to a whopping $1.5 trillion in clean energy investments over the past decade, according to Zindler. That’s not to say there isn’t room for improvement. While renewable energy has made inroads in many developing countries, the most successful stories often start with policy support – or at least not an actively hostile environment. On a level playing field, renewable energy generation can stand toe to toe with conventional power sources in terms of cost in many places, but fossil fuels still receive massive subsidies from policymakers. UN Foundation Senior Fellow and former CEO and Chairman of the Global Environment Facility Mohamed El-Ashry noted that oil, coal, and natural gas receive $550 billion in subsidies every year – more than four times the $120 billion earmarked for renewables. El-Ashry pointed out that these subsidies also contribute to inequality. Only 7 percent of fossil fuel subsidies currently benefit the poorest 20 percent of households, while 43 percent are captured by the top 20 percent, according to the International Monetary Fund. To help investors understand where the best opportunities are and to give governments benchmarks, some useful tools are available to assess the policy environment and renewable energy potential. Bloomberg’s annual Climatescope report, first published in 2012, scores 55 countries in the developing world on their receptiveness and hospitality to private clean energy finance – or “the investment climate for climate-related investment,” as Zindler put it. Data points include local regulations and the prices for conventional electricity, kerosene, and other renewable energy competitors. The National Renewable Energy Laboratory (NREL) provides maps of the world’s renewable resources overlaid with geo-tagged data on resource strength and accessibility. Renewable technology – and modeling technology – is improving so quickly that a 2014 NREL study of wind power in the Philippines calculated five times the potential as a similar study in 2001, said Nisha Thirumurthy, a senior project leader. Thirumurthy stressed that this kind of data benefits all players in the renewable ecosystem. It allows policymakers to see the potential for support; provides power system operators with information vital to successful integration into the national grid; and offers project managers and investors the chance to combine technical data about resource strength with other important information like regulatory frameworks and proximity to transmission lines. This vast and interactive resource is available to the public and allows users to upload their own proprietary information to supplement NREL’s data. USAID recently launched its own global knowledge portal to aggregate data and provide information about its climate change activities, including renewable energy projects. Climatelinks combines links to tools by USAID and other organizations, like the Agriculture, Forestry, and Other Land Use Carbon Calculator and Readiness for Investment in Sustainable Energy map, along with metrics on current USAID programs, a calendar of climate-related events, various training modules, and other resources to assist development practitioners in their work. The Utility Company: Help or Hindrance? While there are some examples of large utility companies playing a major role in scaling up renewable energy, such as Kenya’s new 310 megawatt Lake Turkana wind installation, utilities can also be an impediment to progress, said several speakers. Dennis Volk, a program officer at the International Renewable Energy Association, said that utility companies in the developed and developing worlds alike are heavily invested in continuing business as usual. Getting them to embrace a new paradigm – and renewable energy is just that – requires overcoming a substantial amount of inertia. It took significant intervention by the South African government, for example, to get its national electric utility, Eskom, to increase the share of renewable generation capacity in its planning, said Volk. Meanwhile, organizations like the World Resources Institute (WRI) are demonstrating that it is possible to make major progress on renewables without the utility companies. The biggest lesson developing countries can learn from developed countries is “the role of the large customer,” said Perera. He outlined how WRI is aggregating demand among some of India’s largest industrial power consumers to create financing opportunities for new installations entirely separate from the country’s conventional utility industry. Much of this aggregation has come through WRI’s Green Power Market Development Group, which organizes large corporates buyers to build demand for renewable energy. The group operates in the United States, India, and other markets, and has already achieved several major successes, including a pledge from Infosys – one of India’s largest IT companies – to use 100 percent renewable energy by 2018. As critical as private sector investment is to driving the renewable energy boom in developing economies, it is often public money and NGOs that grease the wheels. USAID’s Power Africa initiative, launched by President Obama in 2013, is “helping to put the African sun to work, as well the wind, water, and geothermal resources,” said Thompson. Power Africa is involved in every aspect of driving clean energy in Africa, said Vant, linking top companies, governments, international organizations, NGOs, and major donors to build what she called “an ecosystem of players to get deals done.” More than 20 full-time transaction and technical advisors are employed by the initiative at any given time, some embedded in energy ministries. So far, Power Africa has collaborated with more than 100 private sector companies and had a hand in $30 billion worth of deal flow, Vant said. In addition, they’ve garnered substantial assistance from other development organizations, like the World Bank, which committed $5 billion last year. One advisor recently put together the framework for the 500 megawatt Corbetti geothermal installation in Ethiopia, that country’s first private power purchase agreement. Another is helping Kenya redesign its electrical grid code to enable integration of renewable resources from Lake Turkana and other sites. These developments in renewables have had a significant impact on access to energy in the developing world, said El-Ashry. They may too portend a much cleaner energy future that will allow us to avoid the worst effects of climate change. But the challenge of bringing electricity to more than a billion people while simultaneously lowering emissions and adapting to the effects of climate change is enormous. A 2014 report from the Asian Development Bank predicted “that the impacts of climate change are likely to result in huge economic, social, and environmental damage in six [South Asian] countries with 1.46 billion people, a third of them living in poverty.” Cuts to the economies of Bangladesh, Bhutan, India, the Maldives, Nepal, and Sri Lanka may be so deep they will create ripple effects around the world. While certainly encouraging, improvements in cost competitiveness, financing, grid integration, the policy environment, and payment models are still just footsteps on the long path to halting massive global emissions from the energy sector while bringing electricity to everyone. 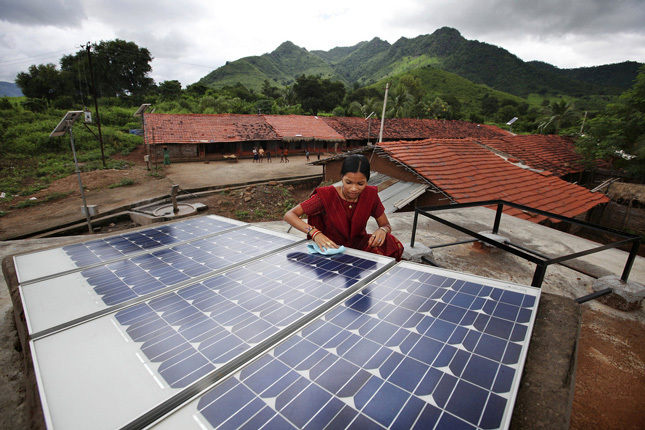 Read part one of “Scaling Up Renewable Energy in the Developing World” here. Sources: Asian Development Bank, Bloomberg, International Monetary Fund, U.S. Energy Information Administration, World Bank. 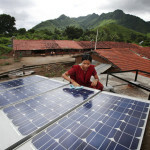 Photo Credit: Solar panels in India, courtesy of Abbie Trayler-Smith/Panos Pictures/U.K. Department for International Development.